There are many different objections that will appear in the minds of prospective customers as they become familiar with your brand. If this business interaction requires submission of their name, email, and credit card number, they will invariably begin to consider risk after they’ve heard your pitch. 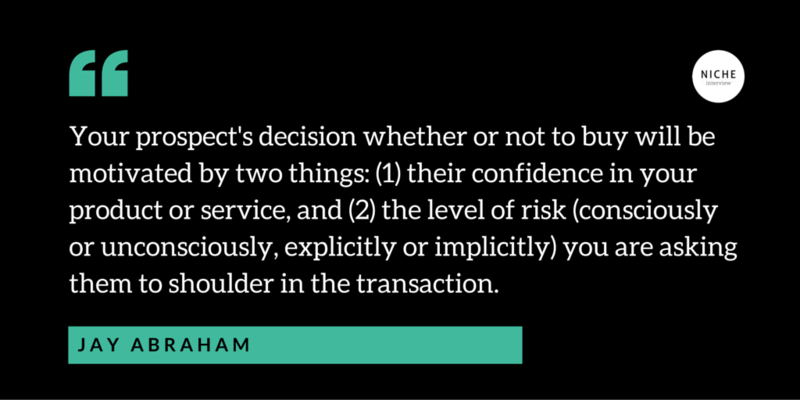 As a supplier, it is your responsibility to overcome these objections by building trust. The following will discuss how reducing customer risk can help build this trust, which will often become the difference between turning a prospect into a customer or losing their interest forever. Examples of risk reversal exist everywhere, from free trials on downloadable software, to mail-in rebates, to zero-interest introductory loans. 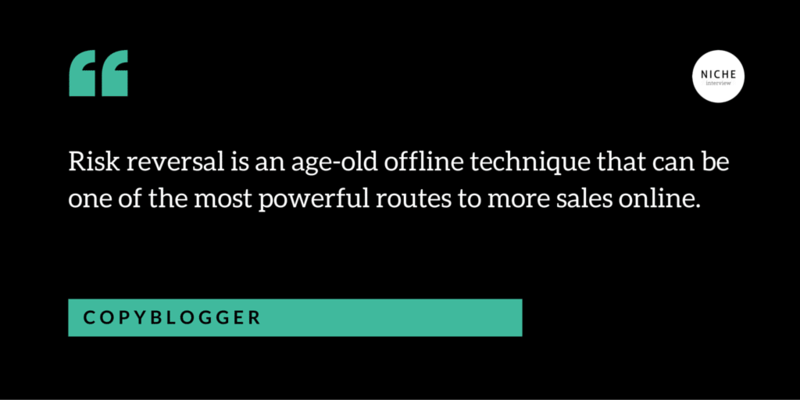 Marketers use this tactic because it works. In fact, a well-implemented risk reversal strategy can increase conversion rates by as much as 300%. The most frequently used tactic is a “money-back guarantee”, as it is the most effective way to remove the friction inherent to the purchasing process. After all, the risk of losing a bit of time is of far less concern than the risk of losing time and hard-earned money. By providing this guarantee, you are risking more than non-refundable shipping costs and inventory that can’t be refurbished. You are also placing your reputation at risk every time you make a promise to the public. Consumers recognize that you’re willing to exceed the unspoken promise between buyer and seller, and to back this promise with tangible assurances. In doing so, you are absorbing any liability that may fall on their hands and placing it in your own. Risk reduction isn’t just a promise extended from you to the consumers, however. Other methods can be used to show the consumer that you’re willing to trust them as well. Payment plans reduce the initial commitment required by the customer, and as a result, they increase the likelihood of future business exponentially. Such leniency may reduce your initial return on investment, but the resulting increase in volume you incur from new consumers should offset any short term expenditures. This is particularly true in human-centered industries that rely on business relationships, as the gratitude earned by meeting customers halfway is reciprocated continually over time. To honor guarantees is to maintain that trust you so carefully built with your public efforts, which can not only retain customers, but create positive publicity about how you deal with grievances and attract new one. Some policies, like those that allow a consumer to keep bonus materials even after they’ve requested a refund on required purchases, are the type of gestures that stay in their minds long after the transaction is resolved. The hit you may take in time or inventory is small compared to the benefits of lasting goodwill, particularly for startup companies that rely on their reputations to expand. You can limit your own risk by imposing reasonable limits to the refund eligibility periods. Most last either 30, 60, or 90 days. Few companies offer unlimited warranties for free, so it is common practice to have set time periods in place to dissuade buyers from cheating the system. Bear in mind that there will always be those who receive an item in perfect condition, break it, and then attempt to return it expecting a full refund. Your policy on this is a matter of your own discretion; larger companies can withstand the small loss of a few items here and there if it means that consumer will spend a lot more down the road, but growing companies will want to have a clear policy on the condition of returned items before making any promises. You may find that most consumers will accept partial refunds for damaged goods depending on the cost of the item and their level of responsibility. The key is to clearly define this policy to avoid misunderstandings. Handling risk situations, such as a consumer requesting a refund, is also an opportunity to separate your level of service from competition. It provides an opportunity for you to gain vital information about what worked and what didn’t during the transaction. Remember, both positive and negative feedback can be valuable tools for improving business. Consider integrating consumer responses into your product development process and your FAQ and help desk documentation, and then use it to optimize website copy and increase conversion rates. Display the money back guarantee prominently at all consumer touch-points. This includes your website, newsletters, sales pages, and product/services descriptions. Streamline the refund process as much as possible. Making a consumer jump through hoops to obtain their refund might delay or even prevent the inevitable, but it will have permanent negative effect on their level of trust and your reputation. Using email to handle consumer complaints and refund requests may be more efficient if you have a large business, but it is better handled by an actual person. If possible, use someone in your management team or handle it yourself. This shows the customer you take their grievance seriously, and is proven to reduce refunds and promote repeat business. Be sure to include refunds in your budget planning before you offer them. While the idea is to generate more revenue than refunds, it is always wise to have contingencies in place. Be aware of what your competition is offering to mitigate risk for their consumers. You may not always be able to meet or exceed them, but you at least want to ensure your terms fall in line with the industry standard. 39 types of risk-reversal guarantees that will improve your sales conversions. 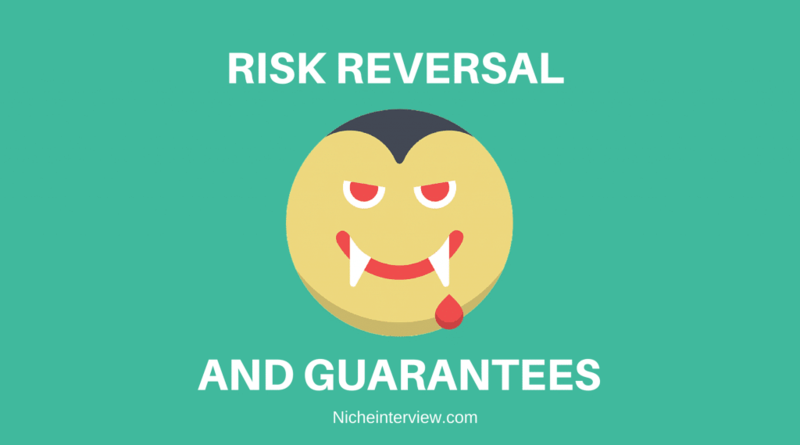 Risk reversal and guarantees can help build trust, which will often become the difference between turning a prospect into a customer or losing their interest forever.